A perfect day for bowling, sunny with a gentle breeze, setting us up for our final match this season, at home to Bonalba. In a keenly contested match where the overall result went down to the wire, each side had two winning rinks and a drawn game, however BBC came out on top by just one shot, 88 - 87, 7 - 5 on points. It was a fine end of season finish for our Berleen team who won well, 22 - 8. Once again Christine Mawson, Mary Cockell, Derek Mawson & Maggie Lawley were drawn on Rink 1. All square after three ends, 2 - 2, after six ends it was 2 - 7, but Maggie and her team had taken the lead by the ninth end, 10 - 7. With a strong comeback Bonalba had pulled away to lead 10 - 18 after the thirteenth end. By scoring a two, followed by a four and another two the BBC team had drawn level again, 18 all with two ends to play. Our team continued their winning run with two more singles to finish 20 - 18 and two points were in the bag. On Rink 3, Sheila Fairbairn, Greg Sperring, Bob Bailey & Brian Doggett were 3 - 2 after three ends, 6 - 3 after six ends and all square on eight shots apiece after nine ends. It was still all square after twelve ends, 11 - 11 but there was a two shot difference three ends later, 14 - 16. The Bonalba team took the last three ends to take the win, 14 - 20. Iris Gardiner, Alan Guest, Trefor Evans & Alex Fisher played on Rink 5 and always had control of their game, 2 - 2 after three ends, 5 - 3 after six ends and 12 - 4 after the ninth. They were still ahead by the twelfth, 15 - 8 and were again eight shots ahead with three ends to play, 18 - 10. With a single and two doubles they closed out their game, 23 - 10 and another two points for BBC. On Rink 6, Jinty Chamberlain, Dave Roberts, Clive Langan & Jacquie Roberts didn't have the best of the first half, 1 -3 after three, 2 - 5 after six and 4 - 10 at halfway but they had pulled back to just three shots down by the thirteenth, 9 - 12. Bonalba pulled away again to lead by seven shots with two ends to play, 10 - 17. A dramatic seventeenth end saw BBC picking up a six to close the gap to a single shot, which they duly scored on the final end, 17 - 17 and another point. Dave Bouttell, Judy Hughes, Richard Gardiner & Richard Chamberlain on Rink 8 were holding shot or shots on several ends but the Bonalba Skip changed that time and time again with some excellent bowls, both running bowls and drawing. It was 1 - 4 after three ends, 3 - 5 after six and 4 - 11 after nine. After the thirteenth end we briefly held a one shot lead, 13 - 12, which was lost when we dropped a four on the next end, but we took a single on the fifteenth to be 14 - 16. Unfortunately we could come back again and the game finished 14 - 22. The Berleen team of Margaret Bailey, Rebecca Langan, Viv Humble & Vivian Erridge were on the difficult Rink 7 but that didn't seem to trouble them. One shot behind after three ends, 1 - 2, but with nine consecutive winning ends they had opened up a thirteen shot gap, 15 - 2 after twelve ends. The last six ends were shared three each but the BBC team had moved further ahead, 22 - 8, a great team effort. So we come to the end of another Winter League season, some great successes and a few disappointing defeats. With nine wins, six draws and nine losses we have finished at mid point in the League table. Our Berleen team won six and lost six and also finish in mid table. Thanks to all of the 'old hands' and also to the 'newer' players who have given their time to play Winter League for BBC, I hope you have found it worthwhile. A very blustery day with the wind swirling and blowing very strongly at times, it did not make for good bowling. Unfortunately we suffered our heaviest defeat of the season and failed to pick up a single point, the scorecard tells the story. Shots scored BBC 56, San Miguel 118. I have to mention and thank the players who came into the side at short notice enabling us to fulfil the fixture with complete teams, they were Viv Humble, Rebecca Langan, Jeff & Linda Richards and Dave & Jacquie Roberts. Next week is our last match of the season, a Home fixture against Bonalba, let's hope for a better result. This game was bought forward from the 10th April, in order to avoid a clash with another visiting side. There was a cool start to the day but it soon warmed up and we bowled in pleasant sunshine. The outcome of the match and the overall shot difference hung on the outcome of the games on the last rinks still playing. With the lead first for BBC, then for Montemar, once again for BBC, but with his last bowl the Montemar Captain managed to get the shot on his rink and gain an overall draw, 80 - 80, with two winning rinks each and a drawn game we also shared those points, five each, so overall 6 - 6. The game was followed by an excellent meal provided by Petra and her team, many thanks. On Rink 1, Christine Mawson, Vivian Erridge, Derek Mawson & Maggie Lawley couldn't get into their game, only managing to win five ends, but never conceding more than a two, 8 - 17. Richard Gardiner, Judy Hughes, Dave Bouttell & Richard Chamberlain on Rink 2 started well enough, 5 - 0 after three ends, 7 - 4 after six and 9 - 5 at the halfway point. Still ahead after the eleventh, 11 - 8, but three threes and a single to their opponents gave them a seven shot lead after fifteen ends, 11 - 18. We couldn't manage the comeback and finished 14 - 20. On Rink 3, Sheila Fairbairn, Ernie Pope, Bob Bailey & Brian Doggett were 1 - 2 after three ends, then a four on the next end put them in front and it was a lead they never relinquished, 6 - 4 after six ends and 12 - 5 after nine. They continued to score well in the second half and ran out worthy winners 22 - 8, having lost only six singles and a double during the game and gaining two points for BBC. Iris Gardiner, Alan Guest, Trefor Evans & Alex Fisher played on Rink 4 and had taken a 5 - 1 lead by the third end, it was 8 - 4 after six and closer at 10 - 8 after nine. By the eleventh end the opposition had drawn level, 10 - 10, two two's opened a gap again, and by the fifteenth they were a bit further ahead, 16 - 11. Once again their opponents closed the gap with a four on the next end, 16 - 15, a two for each team on the next two ends and we still had that one shot advantage at the close, 18 - 17 and two more points. Rink 5, Jinty Chamberlain, Gail Chick, Clive Langan & Trevor Neale had a fairly even exchange for the first five ends when the score stood at 3 - 2 but a run of six non scoring ends saw them drop twelve shots behind, 3 - 15 after the eleventh end. Suddenly there was a glimmer of hope with a four on the twelfth and a two on the thirteenth, just six shots down, 9 - 15; which had increased to eight after fifteen, 9 - 17. With a seven for our team on the next end our hopes high, 16 - 17, a two on the next end, we had taken the lead, 18 - 17, however we had to settle for a draw when Montemar took a single, but it was another point in the bag. After some heavy overnight rain and an 07.30 inspection of the green by yours truly, it was decided that the match would go ahead. It was a cold morning with further showers before the sun broke through towards the end of the game. Two good winning rinks for BBC and each of the other three games were decided by just a single shot, but only one went in favour of BBC. Overall an 8 - 4 points win, where the shot score was 93 - 72. Richard Gardiner, Judy Hughes, Dave Bouttell & Richard Chamberlain on Rink 1 were involved in a very tight tussle, they led 3 - 1 after three ends and it was all square by the sixth end, 4 - 4, but they were two down at the halfway point, 5 - 7. They had just managed to get in front by the twelfth, 10 - 9, but again found themselves behind after the fifteenth, having dropped a four, 12 - 15. Once again they came back taking two of the last three ends but couldn't quite make it losing by a single shot, 15 - 16. Alan Guest, Mary Cockell, Iris Gardiner & Bob Cockell played on Rink 2 and it was nip and tuck for the first nine ends, two shots each after three ends, 3 - 8 after six, but they had pulled back to 9 - 10 after nine. Still close after twelve ends, 12 - 10, but we had taken the lead; which we did not relinquish, 16 - 12 after fifteen, with a final score of 20 - 14 and two points. Rink 3, Jinty Chamberlain, Gail Chick, Clive Langan & Trevor Neale took a three shot lead after the third end, 4 - 1, and were back on level terms after the sixth, 4 - 4, but three consecutive winning ends took them to 10 - 4 after the ninth. A single and a two to their opponents was followed by a four for us on the twelfth, score 14 - 7. By the fifteenth they had moved further ahead, 17 - 8, and closed their game out with a six and a double, conceding a single on the final end, 25 - 9, two valuable points and sufficient shot difference to secure the overall win for BBC. Christine Mawson, Vivian Erridge, Derek Mawson & Maggie Lawley drew the difficult Rink 7 and were in another game where the lead changed frequently. 4 - 1 ahead after three, 7 - 6 ahead after six and 9 - 7 after nine ends. A bit further ahead after twelve, 11 - 7 but the gap had narrowed by the fifteenth to 12 - 11, unfortunately they couldn't quite hold on and also lost by a single shot, 14 - 15. On Rink 8, Sheila Fairbairn, Ernie Pope, Bob Bailey & Brian Doggett were another team that had a close game, 1 - 2 after three, 6 - 4 after six and 10 - 6 after the ninth. There was just a one shot difference after the twelfth when their opponents had taken the lead, 10 - 11, with a five on the next end and a single our team fought back, 16 - 11. Once again the opposition came back at them with a three, a single and another three, 16 - 18 with one end to play. The final end had all the drama with each team holding and losing shot, BBC held two with Brian's last bowl to come, which nicely dropped inside the oppositions nearest bowl to give us a count of three and a one shot win, 19 - 18 and two further points. Hopefully the weather will be much better for our rearranged Home match against Montemar on Saturday. A pleasant sunny day although a little breezy at times. San Luis is a venue where we have struggled in recent years to collect many points and today was no exception when we had just one winning rink, however two other games were very close. The shots were 70 - 99 and points 2 - 10, the Berleen team also lost. On Rink 1, Sheila Fairbairn, Ernie Pope, Bob Bailey & Brian Doggett started well taking three of the first five ends to lead 7 - 4 but four ends later were 7 - 16 down. In the second nine ends they only scored twice to finish 12 - 31. On Rink 2, Iris Gardiner, Alan Guest, Trefor Evans & Alex Fisher also started well by taking four of the first five ends to lead 7 - 2 but had been pegged back to a three shot lead after nine ends, 9 - 6. There were just two shots difference after fourteen ends, 12 - 10 but they finished strongly taking threes on both the fifteenth and seventeenth ends closing out their game, 18 - 14 and gaining our only two points today. Rink 3, Jinty Chamberlain, Gail Chick, Clive Langan & Trevor Neale lost just one end in the first eight to lead 8 - 1 but San Luis came back strongly taking the next five ends to go in front, 8 - 15. The BBC Rink staged a comeback winning four of the last five ends but could not quite score enough shots and finished three shots behind having won eleven of the eighteen ends, final score 14 - 17, very unlucky. It was a different story on Rink 4 where Christine Mawson, Dave Roberts, Richard Gardiner & Derek Mawson just couldn't get going and found themselves 0 - 18 down after nine ends. A five on the tenth end was followed by a four on the twelfth, score 8 - 19. San Luis took the next three ends and BBC took the final three ends, including another five on the last end, but it was not quite enough, 16 - 24. Joyce Pope, Judy Hughes, Dave Bouttell & Richard Chamberlain on Rink 6 were involved in another low scoring game and won six of the first eight ends to take an 8 - 2 lead. However, their opponents took the next eight ends to hold a five shot lead with two ends to play, 8 - 13, despite Richard and his team winning the last two ends they couldn't quite score enough and lost by three shots, 10 - 13, a great effort. The Berleen team of Margaret Bailey, Rebecca Langan, Lynn Stothard & Vivian Erridge were on Rink 5 and lead by one shot after four ends, 4 - 3 but were two shots behind after nine ends, 6 - 8. There was a three shot gap after the fifteenth, 13 - 16 and their opponents went on to win the last three ends and take the game by eight shots, 13 - 21. Next we have two Home games, Greenlands on Wednesday 20th and Montemar on Saturday 23rd, let's hope for much better results. Not quite the weather we were expecting in the South! Dull and overcast for most of the day but at least it kept dry. In a similar manner it was a gloomy day for BBC winning on only two rinks, which gave us four points, with shots of 63 - 90. Christine Mawson, Vivian Erridge, Richard Gardiner & Derek Mawson on Rink 1 played quite well but were unable to win many ends and finished 5 - 27. Another win for Joyce Pope, Judy Hughes, Dave Bouttell & Richard Chamberlain who played on Rink 3. The game was very close for the first ten ends, 2 - 3 after three ends, 5 all after six, and 8 - 10 after the tenth but then with a run of six consecutive winning ends our four had pulled away to 18 - 10 with just two ends to play. A two and a single to their opponents resulted in a final score of 18 - 13 and two valuable points for BBC. It was Rink 4 for Trevor Neale, Ernie Pope, Greg Sperring & Brian Doggett, 1 - 7 down after five ends but two threes put them on level terms; they were still all square at nine ends with the score 8 - 8. Unfortunately their opponents had the better second half resulting in a score of 11 - 16. On Rink 5, Iris Gardiner, Alan Guest, Trefor Evans & Alex Fisher were involved in a fairly low scoring game, 3 - 1 down after four ends and 5 - 8 behind after nine. After eleven ends there was a six shot gap, 5 - 11, but with a four, followed by a single, a three and another single they had taken the lead, 14 - 11 after the fifteenth. A two for the opposition was followed by a single and double for us, 17 - 13, and another two points. On Rink 6, Jinty Chamberlain, Gail Chick, Clive Langan & Maggie Lawley started well with a double and a treble, 5 - 0 after two ends, their opponents fought back to go in front after five ends when the score was 5 - 7. At the halfway point it was 8 - 12 and we had slipped further behind by the eighteenth, 12 - 21. Another Away match next week, this time at San Luis. 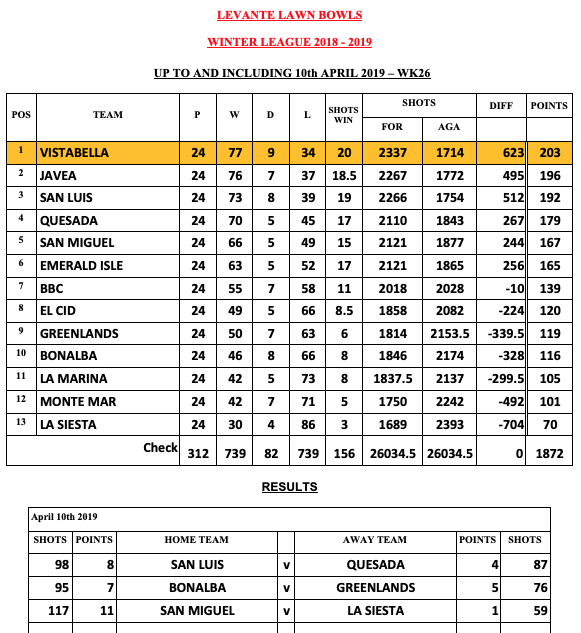 After two Away matches where we achieved good results our expectations were high, unfortunately Vistabella had not read the script and we suffered a heavy 76 to 100 shots defeat, only winning one Rink, so 2 - 10 on points. The Berleen team also lost. 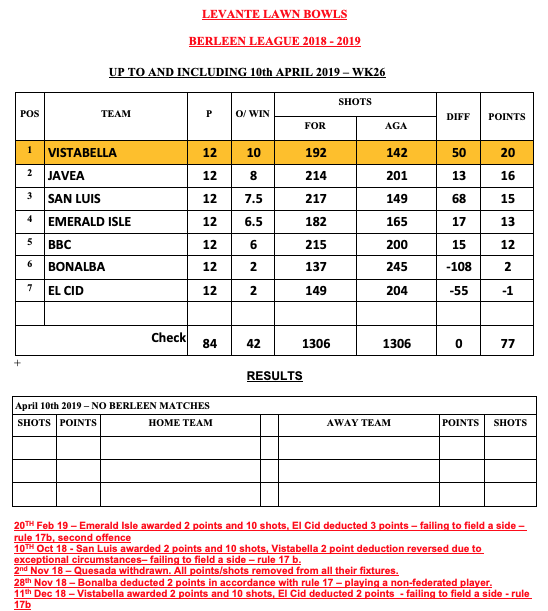 It's not hard to see why Vistabella are at the Top of the League Table at the moment. The one bright spot today was the Rink of Joyce Pope, Judy Hughes, Dave Bouttell & Richard Chamberlain playing on Rink 6. Three shots to one up after three ends, 5 - 3 after six and 7 - 4 after the ninth. A two for the opposition was quickly followed by a treble, a single and a four for us, 15 - 6 after thirteen ends. Despite winning just one more end, Richard and his team kept their game tight to score our only win, 16 - 12 and two points. Well done team. On Rink 3, Iris Gardiner, Alan Guest, Trefor Evans & Alex Fisher found it tough going only scoring on two of the first nine ends when the score stood at 4 - 9. Although they took five of the last nine ends there was still that five shot gap at the end, 13 - 18. Rink 4, Christine Mawson, Linda Richards, Richard Gardiner & Derek Mawson managed to score on ten of the eighteen ends, seven singles and three doubles, unfortunately their opponents had one big count, a seven; which made all the difference, 13 - 22. The difficult Rink 7 saw Trevor Neale, Sam Hughes (a last minute substitute), Greg Sperring & Brian Doggett draw level on the third end, scoring a four, 4 - 4. At nine ends the score was 7 - 11 but with a single, a four and a six Vistabella had taken a big lead by the twelfth, 7 - 22. Our team fought back strongly by taking five of the final six ends, but couldn't score quite enough, 20 - 25. On Rink 8, Jinty Chamberlain, Gail Chick, Clive Langan & Jeff Richards started strongly to lead 8 - 5 after six ends but were one shot behind after the ninth, 9 - 10. A costly five on the fourteenth put them nine shots behind, 11 - 20 and it was the same difference at the end, 14 - 23. The Berleen team were on Rink 2, Margaret Bailey, Rebecca Langan, Bob Bailey & Vivian Erridge had quite a battle, sharing nine ends each with their opponents. Once again a count of four on the twelfth and five on the fifteenth to the opposition was sufficient to give them the edge, 12 - 17 at the close. We are off on the road again for the next two games, let's hope for better results. After a weeks rest the BBC side headed South down the AP7 to Quesada; where points have often been difficult to pick up. Our earlier Home game had produced 6 points for us, Two winning Rinks and the overall shot difference. Today we managed to win Three Rinks but lost out on the overall win by 2 shots, 85 - 87; so once again we collected six points. Another good Carvery lunch followed the game to complete an excellent day. Rink 1, Joyce Pope, Judy Hughes, Dave Bouttell & Richard Chamberlain had drawn a tough team and after three ends were one shot ahead, 2 - 1. Three ends later it was 3 - 6 and after nine ends the score was 4 - 9; still that five shot gap after the twelfth, 7 - 12. After fifteen ends it was 9 - 17 and Quesada took the game 10 - 22. On Rink 2, Iris Gardiner, Greg Sperring, Trefor Evans & Alex Fisher took the lead in the early part of the game, 5 - 4 at three ends and 9 - 6 after seven ends but with a two and a four their opponents had gone in front after nine ends, 9 - 12 and still had that three shot lead after the eleventh, 11 - 14. Our team stayed on eleven shots for the next three ends but the gap had widened to thirteen shots, 11 - 24 after fourteen. Unfortunately, despite winning three of the last four ends, they only closed the gap slightly, 15 - 27. On Rink 5, Jinty Chamberlain, Gail Chick, Clive Langan & Jeff Richards started well with a four but lost the next two ends, 4 - 3 after three ends. A run of four winning ends took them to 11 - 3 after seven but the gap had been narrowed to two shots after ten ends, 11 - 9. Taking four of the next five ends gave them a ten shot lead, 21 - 11 after fifteen ends. The opposition staged a comeback taking the three remaining ends but couldn't catch the BBC team, 21 - 17 and two valuable points. Christine Mawson, Linda Richards, Richard Gardiner & Derek Mawson (welcome back Derek) scored two's on the first three ends to lead 6 - 0 and retained that gap at the seventh end with the score, 8 - 2. Some good scoring over the next five ends saw them stretch the gap to sixteen shots, 18 - 2 after twelve. Some tight play over the final six ends gave them a super 21 - 7 win and a further two points were in the bag. Fely Croft, Ernie Pope, Bob Bailey & Brian Doggett drew an outside Rink again, this time on Rink 7. At three ends it was two shots each, by the sixth it was 7 - 4 and still that three shot gap after the ninth, 9 - 6. After twelve ends the opposition had drawn level, 10 - 10, but with a double, a four and another double we had opened up a good gap, 18 - 10, although the Quesada team took the last three ends they couldn't score sufficient shots to make up the difference, 18 - 14 and a well earned two points. Our first Away match of the year took us to La Siesta, where we arrived on a sunny calm morning to receive a warm welcome from Jenny Bowman and her side. In four of the games the outcome was only decided over the last few ends, fortunately in three of them it went in BBC's favour, in the fifth game there was a good win for the BBC team. So after an excellent carvery lunch, we came home well fed and very happy with ten points and a good shot difference, 99 - 69. 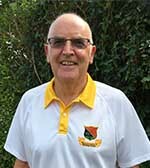 Fely Croft, Ernie Pope, Bob Bailey & Brian Doggett played on Rink 1 and despite winning only seven ends managed to win by 20 shots to 18. After three ends they were 0 - 5 down but a four on the next end closed the gap, a single to the opposition was followed by another four for us, 8 - 6 after six ends. La Siesta took the next five ends before we took a single on the twelfth when the scoreboard read 9 - 15. After sixteen ends the gap was still the same six shots, 12 - 18 but in a dramatic finish BBC scored another two fours to steal the game 20 - 18 and two hard fought points. On Rink 2, Iris Gardiner, Alan Guest, Trefor Evans & Jeff Richards lost a single on the first end but then took a single, a four and a five to lead 10 - 1 after four ends. Six ends later they were still on ten shots but the opposition were just one shot behind, 10 - 9. A couple of twos opened the gap to five shots, which their opponents closed to two shots with a double and single, 14 - 12 after fourteen ends. As there had previously been three dead ends in this game all of the other Rinks had finished and we could watch this game play out. A strong finish by BBC with a three, a two and a single followed by a single to La Siesta saw our Four clinch a seven shot win, 20 - 13 and two valuable points. Rink 3, A slightly delayed start to this game, due to one of the La Siesta players feeling unwell, but a replacement was found and the game commenced. Joyce Pope, Judy Hughes, Dave Bouttell & Richard Chamberlain shared the first four ends and were tied on four shots each. They had the better of the next five ends to lead 10 - 7 at the halfway point and had opened the gap to five shots after thirteen ends, 14 - 9. Unfortunately they were unable to win another end and finished 14 - 20. On Rink 4, Jinty Chamberlain, Gail Chick, Clive Langan & Maggie Lawley dominated their game only losing five ends. A two for the opposition was followed by a five and a single for us and a single for them, 6 - 3 after four ends. With a run of five consecutive winning ends for BBC the score was 16 - 3 after nine ends. After another five ends, with just singles scored, two for us and three for them, the score read 18 - 6 with four ends to play. With a strong finish we took two singles and a two followed by a four, to close out the game 26 - 6 and two more points, a great team performance. On the other outside rink (6), Sheila Fairbairn, Viv Humble, Richard Gardiner & Vivian Erridge were playing together for the first time in the main team. Three down after the first end but with a single, a four, another single and a double they had taken a five shot lead after five ends, 8 - 3. La Siesta closed the gap to a single shot by the seventh end, 8 - 7, and had drawn level after nine ends when the scores stood at nine shots each. A three and a two to us opened a five shot gap again, the next five ends saw just singles scored, two for us and three for them, 16 - 12 with two ends to play. BBC prevailed taking a double followed by a single, 19 - 12 and two more points. A good all-round performance by the BBC side today. Next week we have no Winter League game and then it's off to Quesada on the 20th February. Thankfully the strong winds of the last few days had abated somewhat and although a little chilly at the start the sun broke through to give us some warmth. Today was always going to be a keenly contested match against our local 'rivals' and the bowling on the green proved this. The match ended with two winning rinks each and one drawn game, so five points each; with both sides finishing on 79 shots, the two points for the overall win were also shared. The Berleen team continued their winning streak to record their best win of the season, 37 - 9. Once again Christine Mawson, Linda Richards, Clive Langan & Maggie Lawley found themselves on Rink 1 and got off to a slow start, 1 - 8 after three ends but by the sixth were back on level terms, 8 - 8. The opposition broke away again to lead 8 - 16 after ten ends, but Maggie's four fought back to lie just three shots down after thirteen ends, 14 - 17. Again Jávea Green pulled away, 14 - 23 with two ends to play. This was the last game to finish and the overall score was close, we were just two shots behind. With two singles this rink achieved the overall draw and finished on 16 - 23. On Rink 3, Joyce Pope, Judy Hughes, Dave Bouttell & Richard Chamberlain were involved in a very low scoring game, the highest count being a two, good bowling! They won the first three ends to lead 5 - 0, at six ends it was 6 - 2, and they had maintained the difference at the halfway point, 9 - 5. Jávea then took two two's and two singles to take a two shot lead. After seventeen ends the gap was just one shot, 12 - 13, could we make it! Despite us lying three shots on the final end with only two bowls to come, the opposition Skip drew in to take shot and the game finished 12 - 14. On Rink 5, Iris Gardiner, Alan Guest, Jacquie Roberts & Alex Fisher flew out of the trap, winning the first six ends, to lead by 11 shots. With three singles to their opponents it was 11 - 3 at nine ends. A single to us was followed by a two and two singles to them, 12 - 7 after thirteen ends, two ends late the difference was still the same, 13 - 8. A four for BBC was followed by a three and a two for JG, final score 17 - 13 and two points. On Rink 7, Gail Chick, Ernie Pope, Brian Doggett & Jeff Richards started well to lead 6 - 1 after four ends but at the halfway stage the scores were level at eight shots each. At thirteen ends the teams could still not be separated with the scoreboard reading 10 - 10. The opposition scored a three on the next end and this was followed by a single, a double and another single to us, 14 - 13 with one end to play. A single to them produced the drawn game, 14 - 14 and one point each. Rink 8, Fely Croft, Bob Bailey, Trevor Neale & Greg Sperring were all square on three shots each after five ends. The score was just in our favour after nine ends, 10 - 8; with a two to us followed by a single to them, another two for us and a single to them, the score was 14 - 10 after thirteen ends. We then took a four and a one to lead 19 -10 with three ends to play, although the opposition fought back it was not enough, final score, 20 - 15 and two more points. The Berleen team played on Rink 2; Sheila Fairbairn, Viv Humble, Richard Gardiner & Vivian Erridge lost the first two ends to be 0 - 4 down, but with two two's followed by a four took the lead after five ends, 8 - 4 and never looked back. A single to them was followed by a single, a six and a five to us, 20 - 5 at nine ends. Further high scoring in the second half produced a final sore of 37 - 9 and the biggest win of the season for the Berleen team. A bright but blustery day made conditions difficult for both sides. With Emerald Isle just one place above us this was going to be a keenly fought match but with Home advantage BBC came out in front, winning three rinks to two and taking the additional two points for the overall win by four shots, 90 - 86 and 8 - 4 on points. The Berleen team also had a narrow win by 16 - 15. Christine Mawson, Linda Richards, Clive Langan & Maggie Lawley played on Rink 1, they took a two on the first end only to drop a five on the second, followed by a single on the third, 2 - 6. A three for us was followed by a four for them, 5 - 10 after five ends. Maggie's team then took four consecutive ends to lead 15 - 10 by the halfway stage. The Isle fought back strongly taking five of the next six ends, going into a two shot lead with three ends to play. Our four we not to be denied and won the remaining ends, running out 22 - 20 and two points. On Rink 2, Iris Gardiner, Alan Guest, Trefor Evans & Alex Fisher were just one shot down after five ends, 3 - 4 but with a four, a three and a double went into the lead, 12 - 4 at eight ends. After ten ends the shot difference was the same, 13 - 5, but then the opposition took a six and a single, followed by two threes, 13 - 18 after fourteen. Despite winning three of the remaining ends we couldn't quite make up the difference, 17 - 20 at the close. On Rink 4, Trevor Neale, Ernie Pope, Brian Doggett & Jeff Richards started strongly to lead 9 - 0 after three ends, by the fifth it was 9 - 4 and at the halfway point the score was 13 - 6. Jeff's team took a single followed by a four then promptly dropped a five, a single and a three to lead by just three shots at fourteen ends. Taking three of the final four ends was enough for 'our boys' to secure their win by 23 - 18 and two points. Rink 7, Fely Croft, Bob Bailey, Gail Chick & Greg Sperring won seven of the first nine ends to take a four shot lead, 8 - 4. By there was a complete reversal for the second half with Emerald Isle taking seven of the nine ends, final score, 12 -17. Rink 8 saw Joyce Pope, Judy Hughes, Dave Bouttell & Richard Chamberlain back together again and in a fairly low scoring game we were 1 - 4 down after four ends but had drawn level by the seventh, 5 - 5. Two ends later we were two shots behind, 5 - 7 but with a run of six consecutive winning ends the BBC team had an eight shot lead with three ends to play and came away with a final score of 16 - 11 and two points. An unchanged Berleen team played on Rink 5; Sheila Fairbairn, Viv Humble, Richard Gardiner & Vivian Erridge had an excellent start to lead 6 - 0 after five ends. At the halfway stage it was 11 - 4 in our favour and 13 - 4 two ends later but once again the opposition came back strongly with a four, a two and another four, followed by a single to take a two shot lead after fifteen ends, 13 - 15. Vivian's team took a couple of singles to draw level, 15 - 15, with one end to play. One down our Skip drew shot with her first bowl and that was enough to secure the win, 16 - 15. A reverse of the result earlier in the season when we lost by one shot, 16 - 17! Once again we got the result but will need to be on top form when we meet local rivals Jávea Green next week. Today we welcomed our Northern neighbours, Derek Randall and his El Cid side, to a sunny Benitachell. Following our good start to the year at last weeks game we were keen to keep it going and so it proved to be with an excellent 10 - 2 win, by 108 shots to 74. The Berleen team also recorded a good win, 25 - 13. Rink 1, Linda Smith, Janet Neale, Mike Smith & Trevor Neale stood at eight shots all after seven ends but then lost six consecutive ends and eleven shots, 8 - 19 with five ends to play. Four singles to us were followed by a two for El Cid, 12 - 21. Rod Warnes, Linda Richards, Brian Doggett & Jeff Richards were on Rink 2 and collected five shots on the first end but two ends later it was all square, 5 - 5. Off they went again scoring nine shots to one against over the next five ends, 14 - 6 after eight ends. With a determined fight back the opposition won the next seven ends to move into a four shot lead with three ends left. Our team came back with a five and two singles to record a three shot victory, 21 - 18 and two points. Rink 2, Fely Croft, Bob Bailey, Gail Chick & Greg Sperring won the first three ends to lead 5 - 0 but lost the next three ends to go 5 - 7 behind. Winning the next four ends put our team back in the lead again, 10 - 7 and they were never headed again. 12 - 8 after twelve, 15 - 9 after fifteen, with a final score of 18 - 12 and two points. Christine Mawson, Iris Gardiner, Dave Bouttell & Maggie Lawley played on Rink 5 and led 6 - 2 after five ends but were 6 - 8 down after five more ends. A six on the eleventh end and we were back in front again, 12 - 8; 16 - 10 after fifteen ends with a final score of 18 - 13 and two points. On Rink 7, Clive Langan, Alan Guest, Trefor Evans & Alex Fisher had one of those 'dream' games where they could do little wrong and had taken a fifteen shot lead after five ends. By the ninth it was 19 - 5 and after the twelfth it was 26 - 8, having just picked up a seven. Their opponents took a couple of singles and our team went on to win the last four ends with some good scores including another seven on the seventeenth. Final score 39 - 10 and another two points. The Berleen team played on Rink 8; Sheila Fairbairn, Viv Humble, Richard Gardiner & Vivian Erridge shared singles on the first two ends but then took a six and a four to lead 11 - 1 after four ends. They lost the next end but then won the next four ends to lead 17 - 3 at the halfway point. Although the opposition won more ends during the second half of the game, mostly singles, our team had built up enough of a lead to secure the win and rounded the game off with a five on the final end, 25 - 13. A good all-round performance to set us up for our next match: which is at Home to Emerald Isle. Another clear sunny day at Montemar, perfect weather for bowls. This is a venue where we have sometimes struggled to take points (only four last season), what would today produce! There were a number of last minute changes to the side, which could have affected the balance of the teams, but the BBC players came up trumps and recorded a splendid 9 - 3 points win, with a good shot difference, 93 - 75. A great start to the New Year! On Rink 1, Clive Langan, Alan Guest, Trefor Evans & Jeff Richards (a late substitute for an ill, Alex Fisher, get well soon) started well to lead 5 - 1 after three ends but were three shots behind two ends later, having dropped a six on the fifth. All square at 8 - 8 after seven ends, our team dropped three singles and were 8 - 11 down. With a great run of seven winning ends, including a five and two threes they had put the result of this game beyond doubt, 26 - 11, with one end to play, final score 26 - 13 and two points for BBC. Rink 2, the team of Fely Croft, Bob Bailey, Gail Chick & Greg Sperring were back together again and won the first three ends to lead 6 - 0, but by the halfway point there was just one shot in the game, 9 - 8. In the last nine ends of low scoring game there were never many shots between the two teams, 11 - 9 after twelve ends and 12 - 13 after fifteen, but BBC were not to be denied and won the last three ends to take the game, 16 - 13 and two more points. Rink 3, Sheila Fairbairn (replacing Janet Neale), Linda & Mike Smith with Vivian Erridge (replacing Trevor Neale) were involved in another low scoring game and it was not going our way at the start of the game, 1- 4 after five ends and 1 - 7 after the seventh. Two singles for our team were followed by a three and a five and suddenly we were 11 - 7 ahead after eleven ends. However, the opposition had drawn level by the thirteenth, 11 - 11. A single to us was followed by a two and we were three up with three ends to play. Two singles to the opposition, 14 - 13, with one end to play, nail biting stuff! On the final end Montemar were holding a good three with just Vivian's final bowl to come, all other games had finished and everyone was watching with 'bated breath'. A great Skip's bowl just the right weight to move two bowls and lie second shot! A draw, 14 all and a point for BBC. Christine Mawson, Richard & Iris Gardiner with Brian Doggett were on Rink 4 and started well to lead 5 - 0 after three ends but found themselves four shots behind at nine ends, 6 - 10. By the twelfth it was 6 - 17 and after fifteen, 11 - 18. Final score 12 - 22. Rink 5, Joyce Pope, Ernie Pope, Dave Bouttell & Maggie Lawley took just one of the first six ends to be 3 - 6 behind. A single on the next end was followed by a six, another single and a two on the tenth and the BBC team had taken the lead, 13 - 6. Four ends later their opponents had narrowed the gap to two shots, 14 - 12. With another six shots on the next end followed by a four on the sixteenth end, Maggie and her team had commanding lead, 24 - 12, with a single for each team the game finished 25 - 13 and another two points. A clear bright day for our last fixture of 2018, at Home to San Miguel. With a win on just one Rink and a draw on another we only managed to take three points, 3 - 9 and lost 72 - 97 on shots. San Miguel were able to bring a Friendly Rink with them and the Benitachell four had a good win, 23 - 14. Joyce Pope, Judy Hughes, Dave Bouttell & Richard Chamberlain were on Rink 3, this team is really beginning to gel well together and in a tight match where there we never many shots either way, they finished with a drawn game, 15 - 15 and one point, well done. Rink 4, Margaret & Bob Bailey, Gail Chick & Greg Sperring were 4 - 5 down after five ends and by the ninth it was 5 - 14, in a slightly better second half they managed to close the gap to six shots, 14 - 20. Sheila Fairbairn, Richard & Iris Gardiner with Brian Doggett were on Rink 5 and despite winning only three of the first nine ends, were just two shots behind, 8 - 10. By the thirteenth end they were two shots in front, having just taken a five, 14 - 12, but it was tied on sixteen shots apiece after sixteen and the opposition went on to take the last two ends, 16 - 20. On Rink 6, Jinty Chamberlain, Clive Langan, Trefor Evans & Alex Fisher raced away with a six on the first end, followed by a two on the next end. With some more consistent scoring they led 15 - 7 after nine ends and 20 - 7 after eleven ends, however their opponents closed the gap over the remaining ends to finish just three shots behind, 20 - 17, but it was two points for BBC. Fely Croft, Bob & Mary Cockell with Maggie Lawley were on Rink 7 and did not have a good morning, only winning four ends, to lose by 7 - 25. Our Friendly Rink of Sam Hughes, Rebecca Langan, Alan Guest & Ernie Pope played on Rink 2, thank you all for turning out at short notice. Another great start to lose only one of the first nine ends and leading by 15 - 2, however, this was when their opponents began to find the green and stage a comeback. A four on both the fourteenth and seventeenth ends for BBC put the result beyond doubt, final score 23 - 14, a good win, well done. As we go into the Christmas break I would like to thank you all for your support so far this season and ask for your commitment to the second half of the season, an availability list is in the Cabin. 8 points to BBC, 4 points for Greenlands. Afterwards we had an excellent meal in the restaurant. Joyce Pope, Judy Hughes, Dave Bouttell & Richard Chamberlain, on Rink 4, had a good start to lead 6 - 2 after five ends but the opposition had pulled back to 7 - 6 after eight ends. Four ends later we had slightly increased the gap to three shots, 14 - 11, and in a storming finish, where we lost just one of the last six ends, came out on top by 24 - 12 and two points. On Rink 5, Vivian Erridge, Viv Humble, Mary & Bob Cockell also lead 6 - 2 after five ends but it was 6 - 9 after nine ends. In the remaining nine ends the shot difference fluctuated and we closed the gap at times but couldn't get in front, final score 11 - 15. Rink 6, Fely Croft, Margaret Bailey (thanks for the late substitution), Bob Bailey & Greg Sperring took a single on the first end but dropped a six on the next end when their Skip moved the jack to sit amongst his back bowls. The reply from Greg & Co. was immediate, a four, a three, a single, a double and another single, 12 - 6 after seven ends. During the remaining eleven ends our team only conceded three singles and a three, to take their game by 24 - 12 and two more points. Sheila Fairbairn, Richard & Iris Gardiner with Brian Doggett were on Rink 7, 1 - 4 down after four ends but leading 7 - 4 after seven ends, at the halfway stage it was 6 - 10. Despite winning five of the remaining eight ends they couldn't close the gap and the score was 14 - 18 at the end. On Rink 8, Jinty Chamberlain, Clive Langan, Trefor Evans & Alex Fisher were 2 - 2 after four ends and 7 - 7 after eight ends, but had opened up an eight shot gap three ends later, 15 - 7 at eleven ends. Taking four of the remaining seven ends with good shot scores also saw them take their two points with a 24 - 12 scoreline. A bright sunny day, but as happens fairly frequently, the strength of the wind caused a few problems. Three winning rinks for Benitachell but we just lost out on the shot difference, 88 - 90, so 6 points each. A good win for the Berleen team by 26 shots to 7. Jinty Chamberlain, Clive Langan, Bob & Mary Cockell were on Rink 3, only managing to pick up three shots in the first twelve ends and were 3 - 16 down. Three scoring ends later they had come back to 10 - 16, could they continue this run? Not quite, they won two of the three remaining ends to finish on 12 - 17. On Rink 5, Linda Richards, Ernie Pope, Iris Gardiner & Jeff Richards got the better of the first six ends to lead 6 - 3, but by taking four consecutive ends, their opponents opened up a six point gap, 6 - 12. With true grit and determination they dug deep to win the remaining eight ends to finish with a 20 - 12 scoreline and two points. Christine Mawson, Sheila Fairbairn, Derek Mawson & Brian Doggett playing on Rink 6 had a great first nine ends, only dropping two singles, to lead 14 - 2. It was 18 - 3 after twelve ends and 21 - 5 after fifteen but with a strong fight back their opponents took the remaining three ends scoring eight shots, final score 21 - 13 and two further points for BBC. Rink 7, Fely Croft, Alan Guest, Bob Bailey & Greg Sperring struggled, 4 - 21 down after nine ends and finished 9 - 29. Joyce Pope, Judy Hughes, Dave Bouttell & Richard Chamberlain, on Rink 8, lead 5 - 3 after three ends but were 6 - 10 down three ends later, four good counts put them nine shots ahead after ten ends 19 - 10. Once again a fight back by Bonalba with a two, a three and another two, just two shots behind, 19 - 17. Our team were not to be denied and won four of the remaining five ends to finish with a fine 26 - 19 win and two further points. The Berleen team of Margaret Bailey, Rebecca Langan, Viv Humble & Vivian Erridge, on Rink 4, started well to lead 6 - 4 after six ends. Only dropping three singles in the remaining twelve ends gave them a fine win, with a good shot difference, 26 - 7, and the two points on offer. A bright sunny day and no wind, ideal bowling conditions for a tough match today against a very strong San Luis side. Benitachell had a good win on one rink and had to settle for draws on another two rinks, securing 4 points, however the total shots were against us, 75 - 89. For the second week running Joyce Pope, Judy Hughes, Dave Bouttell & Richard Chamberlain were playing on Rink 1, but they were up against a strong quartet. After losing the first three ends they found themselves 0 - 8 down but with a couple of doubles, followed by a five on the sixth and another double on the seventh they were three shots in front, 11 - 8, after nine ends it was 14 - 9. A three to their opponents was followed by three singles to us, so we still maintained that five shot lead, but singles to the opposition over the remaining ends resulted in a drawn game, 17 shots all, however it was one point in the bag. On Rink 3, Mary Cockell, Clive Langan, Trefor Evans & Alex Fisher took a 4 - 1 lead after three ends but found themselves 5 - 14 down by the tenth end. Stringing together five scoring ends, with two doubles, two trebles and a single they had pulled in front by two shots after fifteen ends. The opposition drew level on the next end and a single to each team resulted in a final score of 17 shots apiece, another draw and another point. Rink 4, Fely Croft, Bob Bailey, Gail Chick & Greg Sperring were involved in a tight low scoring game. Six singles in the first six ends were shared three each. After nine ends it was 6 - 5 and after the fourteenth it was 8 - 9, but dropping a single followed by two two's we were six shots behind with one end to play, a single to us on the final end was not enough, 9 - 14. On Rink 5, Sheila Fairbairn, Ernie Pope, Iris Gardiner & Maggie Lawley all struggled to get into the game and had a bad day finishing 5 - 31. However it was a very good day for Christine Mawson, Bob Cockell, Derek Mawson & Brian Doggett on Rink 7. A super start and they were 7 - 0 after three ends, 14 - 2 after six and 16 - 3 at the halfway point. Continuing to forge ahead over the next three ends put them twenty shots in front after twelve ends, 23 - 3. A late comeback from their opponents on the next three ends, 23 - 9 at fifteen ends, a single to each side was followed by a three for us, which secured a great 27 - 10 win and another two points. The Berleen team of Jinty Chamberlain, Alan Guest, Viv Humble & Vivian Erridge playing on Rink 2 also had a bad day losing by 8 - 23. On an overcast day, when the sun never really broke through, Benitachell were at Home for the match against La Marina. Two Rinks were well in front but the outcome of the three remaining games was only decided over the final ends, however BBC prevailed in two of them and had a good 10 - 2 victory, winning by 29 shots overall, 91 - 62. On Rink 1, Joyce Pope, Judy Hughes, Dave Bouttell & Richard Chamberlain took a 6 - 0 lead after three ends, it was 9 - 1 after six and at the halfway stage was 11 - 4. They continued to dominate their game in the second half, being 20 shots to 5 up after fourteen ends, and taking the two points available with a fine 21 - 10 scoreline. On Rink 3, Jinty Chamberlain, Clive Langan, Trefor Evans & Alex Fisher dropped a five on the first end before getting into the game. Four consecutive winning ends gave them a two shot lead after five ends, 7 - 5; which was increased to 6 shots following the ninth end, 13 - 7. Taking seven of the last nine ends they ran out with a good 24 - 11 win and another two points. Rink 4, Fely Croft, Bob Bailey, Gail Chick & Greg Sperring took doubles on the first two ends to lead 4 - 0. A fight back by their opponents, who took the next six ends, put the BBC team three shots behind, 4 - 7. With a two followed by a three, we had our noses in front again but with a double on the next end La Marina had drawn level, 9 - 9 after eleven ends. It was 11 all after thirteen, 12 all after fifteen and 13 all after seventeen ends, a real 'nail biter'. Two shots to us on the final end, a well earned, hard fought two points. Christine Mawson, Richard Gardiner, Lynn Stothard & Derek Mawson were on Rink 5 and this match turned out to be a game of 'two halves'. BBC were 8 - 1 ahead after five ends, 12 - 4 after nine and 16 - 5 after the twelfth, then the opposition found their 'line and length' and won the next six ends to earn a two shot win, 16 - 18. On Rink 7, Sheila Fairbairn, Ernie Pope, Iris Gardiner & Maggie Lawley were involved in the tightest of games when after thirteen ends just fourteen shots had been scored. 2 - 3 down after five ends, 3 - 7 behind at halfway and after thirteen ends there was still that four shot difference, 5 - 9. With four shots, our team drew level on the fourteenth end, 9 - 9, singles to each side and the score was still level with two ends to play, 10 - 10. With a super finish our team took a two and a three to run out with a five shot victory, 10 - 15, and two points. Overall a good performance by the side, setting us up for the much sterner challenge when we face San Luis next Wednesday. An early overcast start for the journey down the AP7 to Vistabella, where there had been some overnight rain, but fortunately the carpet was only slightly damp and the forecast of further rain did not materialise. To play at Vistabella and come away with six points, for three winning rinks, should be considered a good result, this is a venue where we have often found it difficult to take points in several recent seasons. Unfortunately the shot difference went against us, 79 - 92, and the Berleen team just missed out, 16 - 18. Rink 1 saw the welcome return of Linda & Jeff Richards alongside Lynn Stothard & Iris Gardiner. After dropping a single on the first end, they took a three, a four and a two on the next three ends to take a 9 - 1 lead after four ends. A comeback by their opponents, who took four of the next five ends, saw the gap closed to just one shot, 10 - 9, at the halfway stage. After fourteen ends the Vistabella team had moved ahead by three shots, 13 - 16, but with grit and determination our team took a two on each of the last four ends to earn a well deserved win by five shots, 21 - 16, and gained our first two points. On Rink 3, the unchanged Rink of Jinty Chamberlain, Clive Langan, Trefor Evans & Alex Fisher were slow off the mark, 0 - 6 after four ends but with three consecutive winning ends were just one shot behind, 5 - 6, after seven. By the tenth the gap had widened to four shots, 8 - 12, but with three singles followed by a four our team had moved three shots ahead after the fourteenth, 15 - 12. A three and a single to the opposition were followed by a double and a single for us, which gave the Benitachell team a two shot victory, 18 - 16, and another two points were in the bag. Rink 5 saw another unchanged line up with Fely Croft, Ernie Pope, Bob Bailey & Greg Sperring, who took the first four ends without reply, 5 - 0. By the ninth their opponents had moved to within three shots, 8 - 5, three ends to them, followed by three ends to us and the score was 13 - 9 after fifteen ends. However the last three ends went to us and our team had a good 17 - 9 win and took another two points. Christine Mawson, Chris Barnsby, Richard Gardiner & Derek Mawson were on Rink 7 and shared the first six ends and were just three shots behind, 4 - 7, but that was as close as it got, the final scoreline was 9 - 33. On Rink 8, Judy Hughes, Joyce Pope, Dave Bouttell & Richard Chamberlain had a very close game against a strong team. 5 - 4 after four ends, nine shots each after the ninth and 12 - 9 at eleven ends. The opposition then strung five ends together to take a six shot lead with two ends to play, 12 - 18. Two singles for BBC on the last couple of ends closed the gap to four shots, 14 - 18. Well done. Our Berleen team were back in action again this week and Margaret Bailey, Rebecca Langan, Viv Humble & Vivian Erridge, playing on Rink 6, were involved in another close tussle. After dropping a five followed by a two, they then took a three; 3 - 7 after three ends. They had pulled up to 6 - 9 after six ends but with three ends to their opponents, it was 6 - 14 at the halfway point. Our girls then had a run of five winning ends to move to just two shots behind, 12 - 14; a three for Vistabella was followed by two doubles to us. Just one shot behind, 16 - 17, with one end to play, but it was not our day as the opposition took the final end with a single to take a two shot win,16 - 18, and the two points available. Another glorious day for bowling, with plenty of sunshine and just a gentle breeze. We knew this would be a tough match against the current 'Top of the Table' side and came close to a good win but had to settle for a draw, with six points each. Two rinks for BBC, with three rinks going to Quesada, two of these were close games, only decided on the final end. Overall shot difference went to Benitachell by seventeen shots, 91 - 74. Christine Mawson, Richard Gardiner, Mary Cockell & Derek Mawson were on Rink 3 and played a very tight game. They won the first three ends to take a 4 - 0 lead, at the sixth it was 6 - 2, but by the ninth we were all square at seven shots apiece. It continued to be tight, 12 - 9 at the twelfth, 14 - 11 at the fifteenth and 15 - 13 after seventeen ends. On the final end Christine played two super bowls just behind the jack, but the opposing lead killed the end with a running second bowl. Again Christine played two good bowls and was once again taken off the jack by the opposing lead. By the time the threes had bowled we were two down, Derek just missed picking up the jack with his first bowl and drew into the head with his final bowl, still two down. The Quesada Skip played his last bowl drawing into the head, the bowl was sitting on the running surface but finally dropped into the head for a third shot and a win for them, 15 -16. Bert McLean, Bob Cockell, Iris Gardiner & Maggie Lawley played on Rink 4 and were also involved in a close game, 5 - 5 after six ends and 6 - 7 after nine. Scoring shots on three consecutive ends gave them a four shot lead by the twelfth, but their opponents were again back on level terms by the fourteenth, 11 - 11. Taking a five on the next end, followed by a couple of singles, they had opened up a seven shot gap, with one end to play. Final score 18 - 12 and a well earned, hard fought, two points. Rink 5 saw a slightly changed line up with Fely Croft, Ernie Pope, Bob Bailey & Greg Sperring. This team got off to a great start, taking the first four ends, to move into an 8 - 0 lead, two ends to the opposition and it was 8 - 3 after six ends. Some good bowling saw them take the next seven ends to move into a very strong position, 22 - 3, after thirteen ends. A single and double, followed by a triple, saw the opposition move six shots closer, 22 - 9, but with a single and a three our team took the game by 26 - 9 and two more points. A match which they dominated throughout, losing just five ends, well done. On Rink 6 we had another enforced change, and Judy Hughes, Joyce Pope, Dave Bouttell & Richard Chamberlain also had a very close game. After five ends it was four shots each but by the ninth we had dropped five shots behind, 6 - 11; which was opened up to eight by the eleventh, 6 - 14. With a couple of two's for us, there were just four shots in it; after sixteen ends there were five shots in the game, 11 - 16. Picking up a four on the seventeenth put them just one shot behind with one end to play, but they couldn't quite make it, losing a single on the final end, finishing two shots down, 15 - 17. On Rink 7, Jinty Chamberlain, Clive Langan, Trefor Evans & Alex Fisher were 3 - 2 up after three ends, 3 - 6 down by the sixth but had moved one shot ahead to 7 - 6 after nine ends, another tight game! Two ends later it was ten shots each. After fifteen ends we were two shots behind, 13 - 15 but a dropped five on the sixteenth saw us seven shots adrift, 13 - 20. A single, followed by a three was not quite enough, final score 17 - 20. On a beautiful sunny day for bowling, Benitachell played their first Home fixture of the season. Good scoring on three rinks gave them a 118 - 76 win, which produced six points, plus two for the overall result, a very nice feeling to get our first win. Christine Mawson, Richard Gardiner, Derek Mawson & Brian Doggett were on Rink 2, once again drawing the opposing Captain, with her all Ladies team. After three ends they were 8 - 0 down and by the ninth were even further adrift at 9 - 14. In taking four of the next five ends they had pulled the score back to a six shot difference, 11 - 17, but were unable to keep up the good run and finished on 13 - 21. On Rink 3, Judy Hughes, Dave Bouttell, Richard Chamberlain & Jacquie Roberts had a fairly even first six ends, just two shots down, 5 - 7. By taking a six on the next end, followed by a four they were suddenly eight shots ahead, dropping a two on the ninth end and it was 15 - 9 at the halfway stage. Winning four consecutive ends, scoring 4,1,4 & 4, it was 28 - 9 after thirteen and a five on the fifteenth put them twenty-two shots ahead, 33 - 11, they eventually came away with a magnificent 35 - 12 win and two points. Rink 4, Fely Croft, Bob Bailey, Gail Chick & Greg Sperring were 3 - 1 ahead after three ends but 3 - 8 down at the sixth end and had narrowed the gap by the ninth when the score was 7 - 10. The very next end it was all square, 10 - 10 but with a dropped five on the eleventh it was 10 - 15. Three singles for us closed the gap but this was counteracted by a three for the opposition on the fifteenth, 13 - 18. With two singles for us and a single for them the game finished, 15 - 19. Bert McLean, nice to have you back, Bob Cockell, Iris Gardiner & Maggie Lawley played on Rink 6 and were just ahead after three ends, 3 - 2. At six ends, having just picked up a five, it was 9 - 3 and by the ninth they had extended their lead to nine shots, 14 - 5. Taking shots on six of the next seven ends, they had moved into a comfortable lead after fifteen ends, 24 - 8, their game finished 25 - 11 and two more points. Over by the car park, on Rink 8, Jinty Chamberlain, Clive Langan, Mary Cockell & Alex Fisher got off to a flying start with two threes followed by a five and were 11 shots to nil after three ends. A single for the opposition was followed by three threes and a four for us, with two shots for La Siesta on the ninth it was 24 - 3 at the halfway point. By fifteen ends we had moved further ahead, 30 - 6, but the opposition pulled a few shots back over the last three ends, final score 30 - 13, and another two points. Next Wednesday sees us without a match, so our next fixture is a Home game against Quesada on the 7th November. After heavy overnight rain we all arrived at Benitachell to find the green flooded and unplayable, with no more rain forecast it was agreed to delay the start until 13.00. Once again everyone got to BBC and although the floods had subsided, it was insufficient for the game to be played on our green. Both Captains took the sensible decision to go to Jávea to see if their green was any better, fortunately it was, and with a bit of hard work clearing the last remaining puddles the green was declared playable and the match was played in good weather. A close result in the end but the advantage was Jávea's, by just three shots, 80 - 83 and 4 - 8 on points, the Berleen also lost. On Rink 1, Judy Hughes, Dave Bouttell, Richard Chamberlain & Jacquie Roberts were involved in a very low scoring game where the result could have gone either way. 4 - 1 after four ends but all square on six each after nine ends. By the fourteenth end the opposition had taken a five shot lead, 7 - 12, after a strong fight back over the final four ends our team couldn't quite make it and lost by a single shot, 12 - 13. On Rink 2, Jinty Chamberlain, Clive Langan, Mary Cockell & Alex Fisher found themselves six shots behind after four ends but had pulled back to 7 - 9 after nine ends. The opposition had stretched their lead to seven shots after fourteen ends, 9 - 16. Although we fought back well we couldn't quite make it, 14 - 17 at the end. 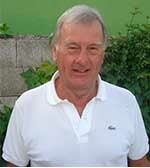 The unchanged rink of Christine Mawson, Richard Gardiner, Derek Mawson & Brian Doggett were on Rink 5 against the Jávea Captain. After taking five of the first nine ends they held a one shot lead, 9 - 8, but by winning four of the next five ends, they took a seven shot lead, 17 - 10. Each side took two of the final four ends and the game finished, 21 - 13, with two valuable points for BBC. Our new all female team of Sheila Fairbairn, Viv Humble, Lynn Stothard & Iris Gardiner on Rink 6 kept it close over the first four ends, 4 - 2, but five consecutive ends for Jávea saw them take an eleven shot lead by the halfway stage, 4 - 15, which had been extended to sixteen shots by the thirteenth, 7 - 23. Our 'girls' pulled a few shots back and finished on 12 - 26. Rink 7, Also unchanged, Fely Croft, Bob Bailey, Gail Chick & Greg Sperring found themselves 0 - 8 down after four ends, but after seven consecutive winning ends they held a four shot advantage, 12 - 8 after eleven ends. After fifteen ends the BBC quartet were just behind, 13 - 14, but with a storming last three end finish, they took a four and two doubles, to win by seven shots, 21 - 14 and two more points. The Berleen team of Margaret Bailey, Joyce Pope, Vivian Erridge & Ernie Pope just couldn't get going and it was on the ninth end that they scored their first point, 1 - 18. With a final result of 6 - 35 it was just not their day. Thanks must go to Brian Taylor of 'The Inn on the Green' for allowing the game to go ahead. An early start for the long journey to our furthermost fixture. On arrival it was somewhat overcast and rain looked possible but we need not have worried, as the sun broke through giving us warm sunshine for most of the match. The result on the green was not quite as sunny for BBC, winning on just one rink and taking only 2 points. BBC 69 - Emerald Isle 97. The Berleen team just missed out losing by a single shot, 16 - 17. On Rink 1, Jinty Chamberlain, Clive Langan, Trefor Evans & Alex Fisher once again drew the opposing Captain. With three threes and a single in the first nine ends they led by 10 - 6 at the halfway stage. They won the next three ends to go 12 - 6 up after twelve ends but a dropped seven on the next end saw them go behind, 12 - 13. The game finished with that one shot difference, 17 - 18. Christine Mawson, Richard Gardiner, Derek Mawson & Brian Doggett were on Rink 2 and won seven of the first eight ends to lead 9 - 1. With a four and a single the opposition pulled back to three points behind, 9 - 6, two singles for us and a lead of five after twelve ends, 11 - 6. On the next end a six count for Emerald Isle and they were ahead for the first time, another single gave them a two shot lead, 11 - 13 after fourteen. A double on the fifteenth, followed with another double on the sixteenth gave BBC the lead again. A single for each team on the last two ends saw BBC run out with a two shot lead, 16 - 14 and our only two points. On Rink 3, Judy Hughes, Richard Chamberlain, Mike Smith & Jacquie Roberts took just two ends of the first nine and the score was 4- 14. the second half was a more even affair but we couldn't make up that early deficit. Final score 14 - 25. Sheila Fairbairn, Janet Neale, Iris Gardiner & Trevor Neale on Rink 4 also found themselves behind after nine ends, 3 - 12. A better second half, but still that difference at the end, 11 - 21. Rink 5, Fely Croft, Bob Bailey, Gail Chick & Greg Sperring were just four shots behind after nine ends, 5 - 9. By the final end the Emerald Isle lead had been extended to eight shots, 11 - 19. On Rink 6, our Berleen team of Joyce & Ernie Pope, Dave Bouttell & Vivian Erridge were involved in another close game. Shots were even after nine ends, 7 - 7, with a single for the opposition on the tenth. But a two on the eleventh, followed by a five on the twelfth and a two on the thirteenth our team had taken an eight shot advantage. Their opponents dug in and clawed their way back to draw level with one end to play and then went on to take the game by a single shot, 16 - 17. Next week our first Home game pits us against local 'rivals' Jávea Green, a match that will be keenly contested. We received a warm welcome from Captain Derek Randall and the members of El Cid, very pleased to see them back in the Winter League this year. 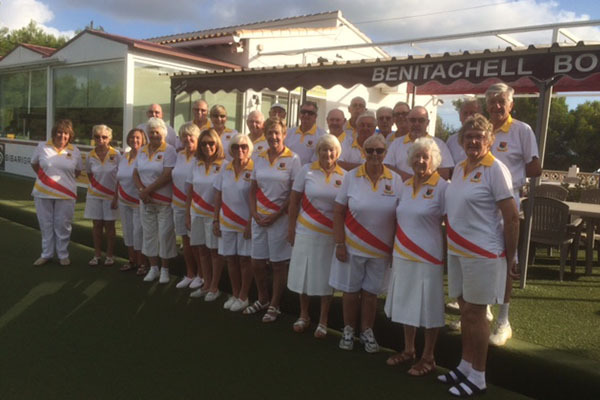 Benitachell have a number of 'new faces' in the Winter League Squad this year and it is a pleasure to welcome them 'onboard'. A competitive game followed and over the last three ends the outcome was unsure as the overall lead fluctuated between the two sides. However it was El Cid's day, with them winning three Rinks to two and taking the overall shot difference by five, 78 - 83, 8 - 4 on points. Our Berleen team had a narrow win 18 - 17. On Rink 1, our Berleen team of Joyce & Ernie Pope, Dave Bouttell & Vivian Erridge were looking to start the defence of their 'Winners' title. A game where there were never many shots between the teams, 7 - 7 after five ends, 12 - 12 after eleven ends and 15 - 15 at fifteen ends. After dropping a single on he next end a crucial three on the seventeenth set up the chance of a win. Only losing a single on the final end we came away with a hard fought 18 - 17 victory. On Rink 2, Sheila Fairbairn, Janet Neale, Iris Gardiner & Trevor Neale took a while to settle into their game and found themselves 1 - 8 down after five ends and the opposition had extended their lead to 4 - 13 after ten ends. A determined fight back by our team over the next five ends saw them pull back to just three shots behind, 11 - 14, but they couldn't quite make it and ended with just a single shot deficit, 14 - 15. Rink 3 saw Jinty Chamberlain, Clive Langan, Trefor Evans & Alex Fisher up against Derek Randall and his team. At five ends the honours were even at 5 - 5, but after ten ends we were four shots down, 8 - 12. By the fifteenth it was 10 - 18 and finished 13 - 22. Christine Mawson, Richard Gardiner, Derek Mawson & Brian Doggett were never in front in this game, 4 - 5 after five ends, 7- 12 at ten ends and 8 - 15 after fourteen ends. A run of three doubles put us just one shot behind with one end to play but it wasn't to be, final score 14 - 17. On Rink 5, Judy Hughes, Richard Chamberlain, Jacquie Roberts & Maggie Lawley faced a strong ladies quartet lead by Yvonne Briden. BBC had a great start picking taking a count of four on each of the first two ends, after five ends the opposition had pulled back to 8 - 5. Some determined bowling by our team over the next five ends saw them restore that early eight shot lead, 15 - 7 after ten ends. A strong fight back by El Cid saw them cut back our lead to three shots after fifteen ends, 19 - 16. A single to us against two singles to them put the final score at 20 - 18 and two valuable points. Out by the wall on Rink 6, Fely Croft, Bob Bailey, Gail Chick & Greg Sperring were four all after five ends but by ten ends they had a five shot lead, 10 - 5. This was extended to ten shots after the sixteenth end, 17 - 7, there was some consolation for their opponents who took a single and treble in the last two ends, final score 17 -11, two more points for BBC. I have been asked to mention that the whole team played well and that in three ends Gail Chick played some great bowls, giving a turnaround of twelve shots, taking the momentum away from their opponents at the right time.